Gather round, few survivors of the apocalypse! Join one of the 4 tribes that are struggling to survive into their underground shelters, far from the surrounding radioactivity of the atmosphere. Decide to allocate resources as best as you can, build new rooms, fix equipment and, above all, feed your kin. Plan carefully the moves of your heroes, whom you sent outside to gather food, water, supplies and everything that can be useful to your tribe. And be careful, other tribes become more and more hostile towards each other. I tell you no lies, the Convoy is coming� It's the last hope for survival. Unfortunately it will only take the best tribe. You must prove your value, whatever the price. And if you need to lose your humanity in the process� so be it. Survive! Outlive is a management/survival game in a post-apocalyptic universe where nature has overcome its rights. During the day, you will send your heroes to gather resources, while avoiding threats from other players. At night, you will reinforce your settlement, and try to recruit new survivors to adapt to this new world. The game offers a innovative gameplay of worker displacement, where the gathering of resource is compelled by you heroes' strengh and the actions the other players have done previously. Outlive is a workers placement boardgame, a workers displacement boardgame to be precise. The special feature of the game is that you can't always collect what you want, when you want. You have to plan carefully your displacements, in order not to come to late in a place where everything has already been collected, not to put your weakest heroes to close to the strong opponents' ones, and of course to serve the better your growth strategy! Depending of those choices, you will collect more or less resources. Spend these resources wisely to build your shelter, equip your heroes and of course feed your tribe! In this post-apocalyptic world, resources are scarce, and you will have to make tough choices if you want to survive. 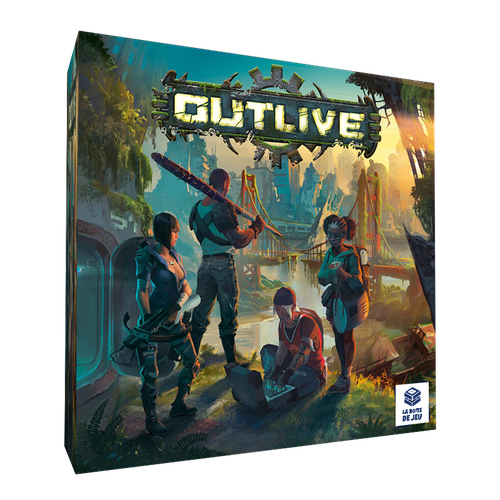 Outlive is for core gamers, from 2 to 4 players, and games last around 20min per player.